The new holiday catalog from Stampin’ Up! (now live!! – PDF is here, shoppable here) is delicious from beginning to end. Most of the Halloween stuff is near the end of the catalog, and let me tell you, it’s all AWESOME. There’s seriously not one Halloween item that isn’t on my wishlist. I’ve already bought about 2/3 of the Halloween stuff and will buy the rest of it in September, probably today (stupid living-on-a-budget). All of it. 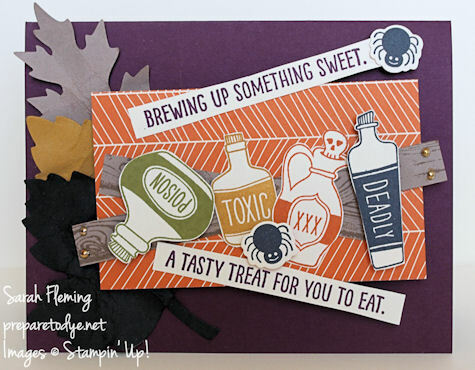 And this card is made using one of the killer — pun intended — stamp sets, Sweet Hauntings. 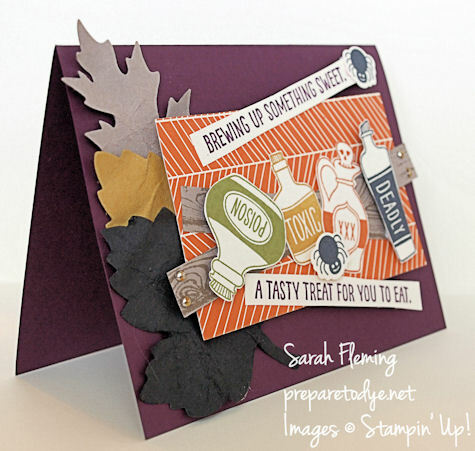 I made this card for the Fab Friday color challenge, which to me screamed Halloween. I added the leaves last just to give the card a little something extra. I originally had an orange (Tangelo Twist) leaf on the card but decided it would be much deadlier to replace that with a black one. :) To give the leaves the dead, crumpled look, I simply sprayed them several times with a Stampin’ Spritzer filled with water, crumpled them into balls, unfolded them, and laid them out to dry. They only need a few minutes to dry and add such a fun dimension to a spooky card. The spiders are from the Howl-o-Ween Treats stamp set (and coordinating framelits). I have another fun card using that set this week. To make the boards behind the bottles, I stamped the Hardwood background stamp on Tip Top Taupe in TTT and cut them to size with my Stampin’ Trimmer. The “nails” are the 1/8″ silver brads, which I colored with a (discontinued) Pumpkin Pie blendability to make them look rustier. You can use any alcohol marker you have, or a Sharpie. If you haven’t seen the new catalog (my customers should have received theirs by mail by now), click over and take a look! I mean, if you have a few hours to gawk. Hashtag awesome catalog. Tomorrow (or today if I get time) I’ll show you something I made with the Festive Flower punch. Unless I’m in labor or something. I really like this! Those little poison bottles are the cutest ever – and the leaves make a perfect spooky backdrop, lol. Thanks so much for playing at Fab Friday! How cute! 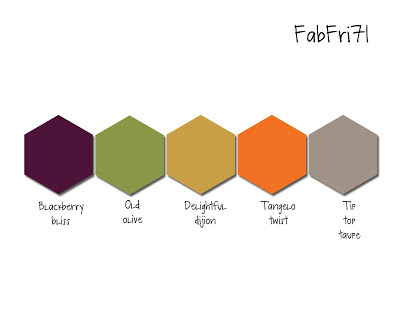 These colors make really cute poisons, ha! Thanks for playing at Fab Friday! Thanks, y’all! Great color combo! I just love this card! Cute and creative…I just may have to have this stamp set now…Just so I can CASE your card! Very cool card!! Love the “boards” and potions!! Thank you for joining us at Fab Friday! !